Hard Drive Eraser - destroys ALL data on your hard drive, once for all. Free software. No spyware or adware. Hard Drive Eraser is free Windows application that permanently erase the data on whole volumes (hard drives). It does so by filling the magnetic surface multiple time with a useless binary data. It is a known fact that it is impossible to permanently destroy data just by formatting hard drive. It doesn't matter if you use Windows formatting or pay for a commerical disk formatting program. It wont work. In it's essence formatting drive is same as deleting files in Windows and than removing them from Recycle Bin. Just a small bits of information (links to files) are removed but the files still reside on hard drive and it is very easy to recover them using either commercial solution or one of applications for data recovery. That's why you may want to use Hard Drive Eraser, to shred the drive partition beyond any possible recovery. Do you know that it is a favorite pastime of people that work in hard drive repair services to recover the content of a formatted drive and dig through it in a search for "interesting" content. A test conducted by PC World shows how easy is to recover the information from a formatted drive. A number of free utilities for data recovery is available, as well as some very powerful commercial solutions like data recovery software from Disk Doctors. Today, just about anybody can recover all data from a drive that is formatted and dumped into garbage. The main danger lies when a company wants to get rid of old hard drives - formatting a hard drive and trashing it is an open invitation for security troubles. Every day tens of thousands of hard drives stops working. Sometimes it starts with accumulating bad sectors which is a sure sign hard drive is near the end of its life, and sometimes hard drive clicking point to a serious mechanical error. Either way, users or companies that try to fix their drives by sending them to a service or just trashing them are at a risk. Secure hard drive erasing is the only way to have piece of mind and assure that a personal data is irretrievably gone. Secure hard drive erasing is a method where a series of random binary data has been written into the hard drive, making it nearly impossible to recover such erased information. This method is slower than simple formatting but assures that information's on your hard drive will not be exposed. Hard Drive Eraser is powerful free software that will erase your hard drive in a way that prevents any future possibility of data recovery. Hard Drive Eraser is released under GNU General Public License and it is free for personal and commercial usage. You can download Hard Drive Eraser here. Hard Drive Eraser will work on any computer with Windows Vista or Windows XP Operating System. 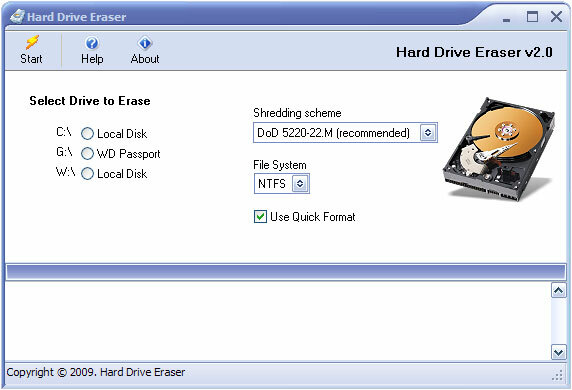 Hard Drive Eraser uses an advanced and secure algorithms to erase drive volumes and partitions. The speed of erasing is dependant of the speed of your system, particularly hard drive. To download Hard Drive Eraser check the download page with the latest version. The usage of Hard Drive Eraser is very simple. You pick a drive you want to erase, choose a shredding scheme (an algorithm used for shredding) and file system, and press "Start" to execute drive erasing. You can only erase a hard drive, or partition which is not used as a system partition from within the program is running. To further explain, if you have a C: as you system disk or partition you can only erase D, E, F etc. partitions. If you want to erase C partition, the one where operating system reside, you would have to access it from the other instance of operating system from other partition, or preferably take out the drive from the computer, connect it to another computer and erase it from there. One hard drive can have more than one partition, and if you want to erase the whole hard drive you should erase all its partitions. To learn more about disk partitioning check the wikipedia article here. Ideally, if you want to get rid of old drives in your company you can have one computer which serves for partitioning other drives, than plugging old drives you want to erase onto it (by using hdd rack, usb case rack or so). This way only one instance of Hard Drive Eraser will be installed. Before starting the erasing process double check that the partition you are about to erase actually the one you intended to erase. Erased partitions can not be recovered, otherwise this program wouldn't exist. You use Hard Drive Eraser at your own responsibility. The author of this program can not be held responsible or liable, directly or indirectly, for any loss or damage caused by the usage of this program. If you prefer the professional support and safety choose a commercial product such as one of the excellent tools from Cyber Scrub (cyberCide disk eraser direct donwload here) Users concerned about privacy of their daily collected data should also check Privacy Eraser. If you want to recover a data lost after hard drive crash or after formatting check software collections of file recovery products from Disk Doctors or Pro Data Doctor, both are awesome suite of products for all possible purposes. Securely erases whole volumes, disk drives, partitions or floppy drives. Overwrites data multiple times using one of four advanced algorithms which assure erased data can not be recovered. Works with all file systems (NTFS, FAT32, FAT). Simple, light weight and optimized for speed. Peter Guttman method for users paranoidly concerned about security of their data.